Seriously its really hard to feed greens to kids, but thank god my kids love greens very much especially spinach. They just love it to the core. I can add spinach in anything and my kids can have them without any hesitation. Obviously i'll cook spinach atleast twice a week for our lunch. Recently i tried adding some chopped spinach in samosa along with potatoes. Trust me these spinach potato samosa was a big hit among my dearies and they enjoyed thoroughly with their favourite sauce. Usually i'll avoid deepfrying samosas and go for the guilt free baked ones, but this time i opted for deepfrying. Dunno how to feed greens to your kids, just give a try to this fantastic crispy samosas, am sure your kids will definitely enjoy these deep fried beauties.Sending to Viji's SYS-W series - Hidden Ingredients. Take the maida, wheat flour,salt and oil in a bowl, add gradually enough water and knead as soft and stiff dough,keep aside for half an hour. Heat enough oil,let crack the cumin seeds, add the chopped spinach, chopped carrots, saute until the veggies gets half cooked. Add now the spice powder, mashed potatoes and salt, cook everything in simmer for few minutes, put off the stove. Make tiny balls from the dough, dust with flour and roll them as circles, cut in the middle of the circles. Make two demi cricles, just fold the sides to make a cone, now gently put some already prepared spinach potato masala inside the cone. Meanwhile prepare the maida paste by mixing the flour and water together. Use this maida paste to stick the edges..continue the process until the masala and dough get finished.. Enjoy with ketchup or with a cup of tea..
looks so yummy .potatoes with spinach in a deep fried flour combo will be great . yummm , perfect looking samosas. Samosas look so yumm and nice idea of adding greens to it. These samosas look really delectable! Crispy samosa made from scratch using wheat flour in it. The stuffing is also healthy by the addition of spinch in it. Superb. i loved the idea. .spinanch and aloo must be delicious. Oh wow! These samosas look so perfect, lovely filling too! Crispy and yummy samosa dear...Love to grab it now !! 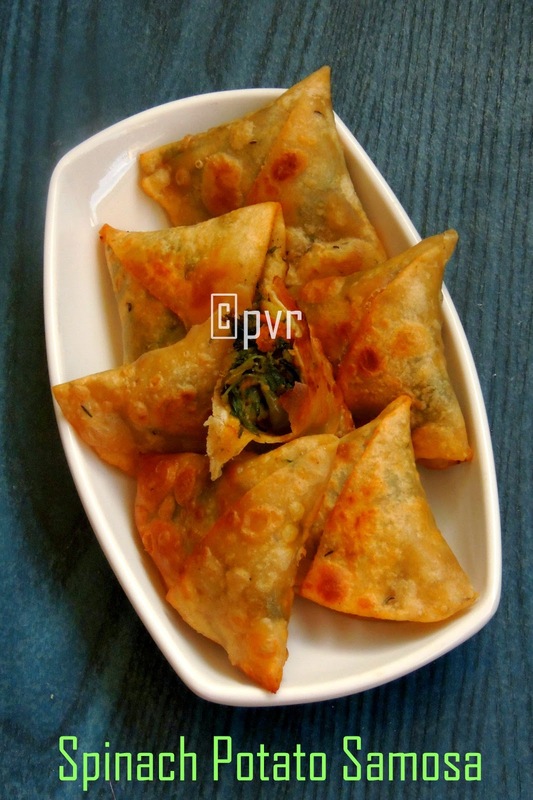 i love samosas..this stuffing is just too good ,the combo of potato and spinach is so good..need to grab some right now..
A samosa that can be had without much guilt.Thanks for sharing. Love samosa n this looks very inviting n healthy..
Tes samossas sont magnifiques. Ils doivent être délicieux. Yumm, reducing the guilt factor :-), they look delicious.